All Newport Beach homes have something in common: access to the best beaches in the world, incredible shopping and year-round sunny weather. 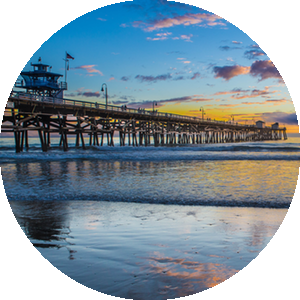 Newport Beach has a lot to offer, making it one of the most active real estate markets in the nation. From breathtaking luxury estates and beautiful beach homes, to single-family starter homes and stylish condos, the Newport Beach homes for sale are diverse in style, function and price. Newport Beach properties are divided into villages, each with a unique style and atmosphere. The distinct houses in these villages allow diverse neighborhoods to come together to create a colorful, robust community that attracts residents from all over the world. Balboa Peninsula: Sandwiched between the Pacific Ocean and Newport Harbor, Balboa Peninsula is known as a fun destination to dine, surf and shop. Balboa is home to "The Wedge," known as the one of world's most challenging body-surfing spots, as well as the Bayfront and Ocean Boardwalks. Lido Marina Village: With gorgeous views of the water and brick-paved streets, this historic harbor is one of the most charming regions in Newport Beach. The marina itself hosts dozens of large yachts, and attracts owners from around the world to its annual yacht festival. Cannery Village: Cannery Village is a hybrid between the past and present of Newport Beach, mixing brick sidewalks and historic architecture with modern venues and amenities. This neighborhood is a great place to catch a show, take a self-guided tour of the publicly displayed artwork or catch a show at the historic Regency Lido Theatre. Corona del Mar: This seaside village is a beautiful neighborhood, nestled between the Pacific Ocean and the San Joaquin Hills. Along the main strip, residents can find trendy boutiques, vintage and antique stores and a wide-collection of services. Corona del Mar is also home to golden beaches, the Sherman Library and Gardens and the Corona del Mar State Beach. Fashion Island/Newport Center: Fashion Island was inspired by the beautiful Mediterranean, featuring the best outdoor shopping in the state. With approximately 200 shops and specialty boutiques, it's easy to "shop 'til you drop" in this district. Fashion Island also has dozens of eateries including prime dining establishments with outdoor patios. Newport Coast/Crystal Cove: Nature lovers delight in this village, with preserved natural landscape and complementary architecture. This luxurious community is one of the most beautiful neighborhoods in Newport Beach and features an exquisite collection of restaurants and shopping. Golfers will delight in the 54 championship holes at Pelican Hill Resort, while the Crystal Cove State Park serves as a favorite destination for hiking, camping and sight-seeing. Newport Harbor Islands: These seven islands, including Balboa, feature some of the most expensive and luxurious real estate in the nation. With limited access, these islands must be reached by boat. Balboa is the only island with a public ferry and a few of the islands do not allow vehicles at all. Mariner's Mile: Boat and auto-lovers unite in Mariner's Mile, which serves as the center of Newport Beach's luxury yacht and car district. This village has a bounty of restaurant options, attracting visitors and residents from around the city to its dining destinations. Newport Beach houses a well-established community and has a variety of activities for residents to participate in and enjoy. With many fantastic opportunities to play, dine and relax, Newport Beach residents tend to indulge in spa days, shopping, sport fishing, adventure tours, theatres and museums and endless touring musicians and events. 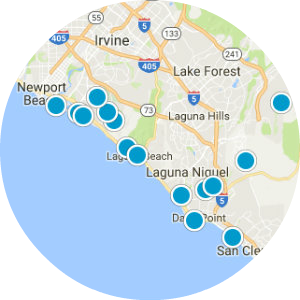 Newport Beach homes are close to several private yacht clubs and the beautiful Newport Harbor, the United States' largest recreational harbor. Many residents who own houses in Newport Beach frequent the harbor and enjoy boating, sailing, fishing, kayaking and a number of other water-based activities.